Our gorillas, chimps, and monkeys can move and talk! Movements such as eye, head, arm, breathing, talking and tail may be added to enhance the life-like quality of your animal. Use your own recorded message or carry on a candid conversation with customers or guests using a wireless microphone. 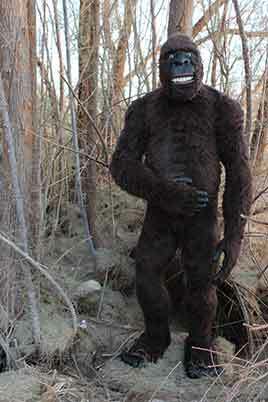 Continue below to browse our static and animatronic gorillas, chimps, and monkeys that we have made in the past.